Today is my husband's birthday and so I made this cake for his birthday.I would like to thank all my blogger friends who inspired me with their beautiful fondant cakes.This was a much awaited wish to prepare and so am very happy today that I could make a presentable cake for S's birthday.The base of the cake is Eggless Chocolate Cake that I already posted.Layered the cake with whipped cream and covered with homemade marshmallow fondant.The recipe for marshmallow fondant is taken from Manju's Eating Delights,Thanx manju for the recipe.Kids loved the cake very much as it was their favorite chocolate inside and yummmy fondant outside.Am very sorry about not posting the detailed pics,as I was short of time to click pics.Though am not an expert in decorations,just referred videos Hubby was very much impressed and was happy at my first attempt.And that made my day,feeling happy !!! -Place the bowl in freezer for 30 mins and the blades of hand mixer as well. -The whipped cream should be cold otherwise it will not form peaks. -Add the whipped cream in the cold bowl,whisk on low speed.Continue to whisk along with sugar until you reach soft peaks. -In the mean time,add cold water to gelatin.Leave for 6 mins and then add about 50ml hot water or bring the mixture to boil.Leave to cool. -Add the gelatin mixture,vanilla extract to the soft peaks and whisk again until you reach the stiff peaks. -Scrape and refrigerate until you use for frosting. -In a microwaveable safe bowl,add 1-2 tbsp of water and the bag of marshmallow.Heat on high for 1 minute or until marshmallows begins to fluff and melt.Stir with a spatula to get a thick paste. -Add powdered sugar little by little in the bowl and mix. -Cover with a cling wrap and keep aside until you use. 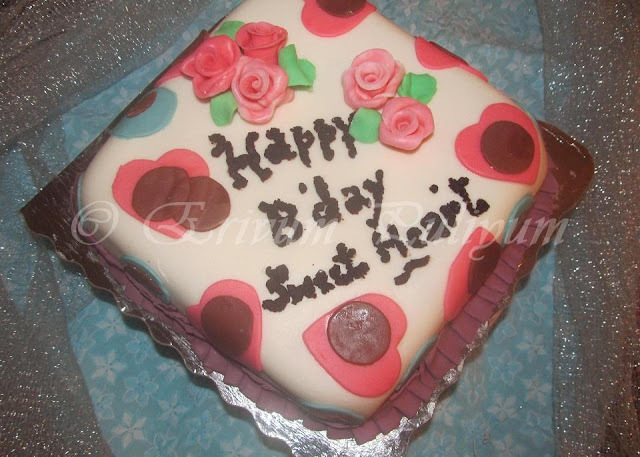 -This is the video link ,I referred to make fondant rose. * I had not used gelatin in whipped cream and so the whipped cream became very soft by the time we cut the cake.Gelatin helps to stabilise the frosting. 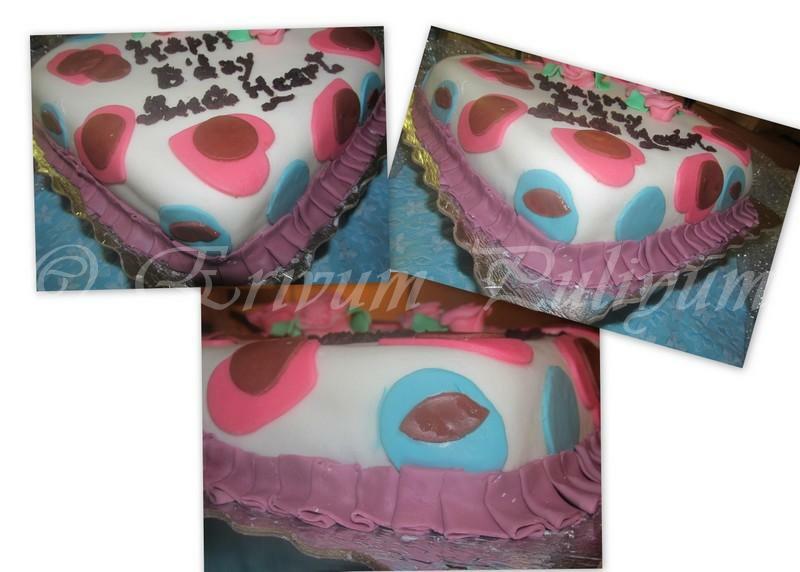 * Add the icing gels in a short piece of fondant and knead softly until the gel is incorporated completely. * Tried adding shades to roses,marbling effect-referred this video link. * Always keep your fondant wrapped in cling wrap,If your fondant dries up.Add a tbsp of water.If your fondant is sticky add powdered sugar or corn starch or corn syrup. 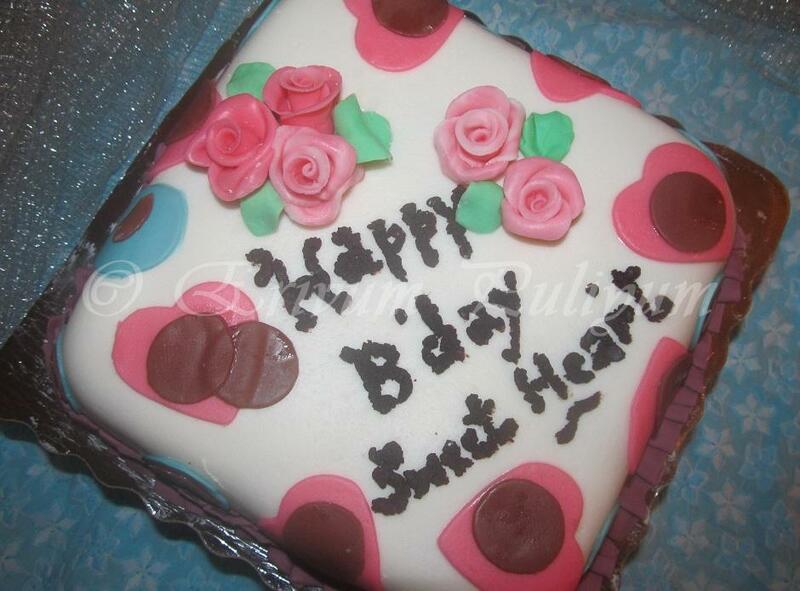 * Usually gum paste is added to the colored fondant to prevent sticking,I haven't used that. 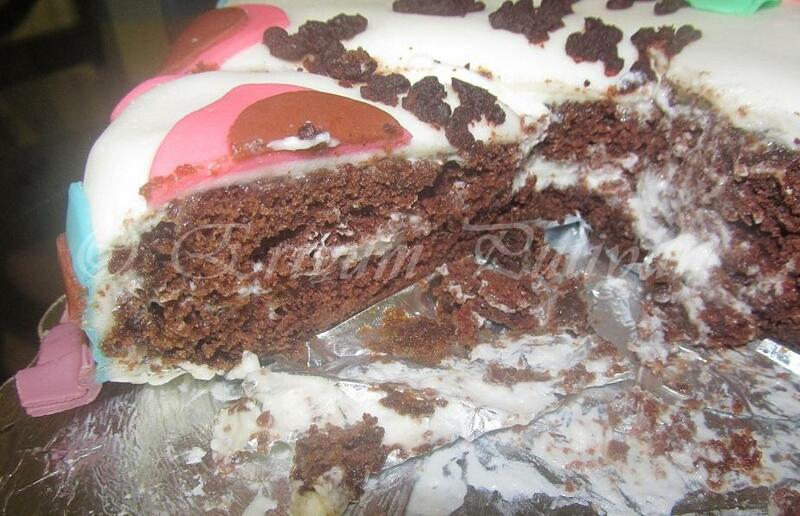 * You can use store brought cake mix to make the cake too. wow...thts a great attempt Julie!! Cake looks really yummy! 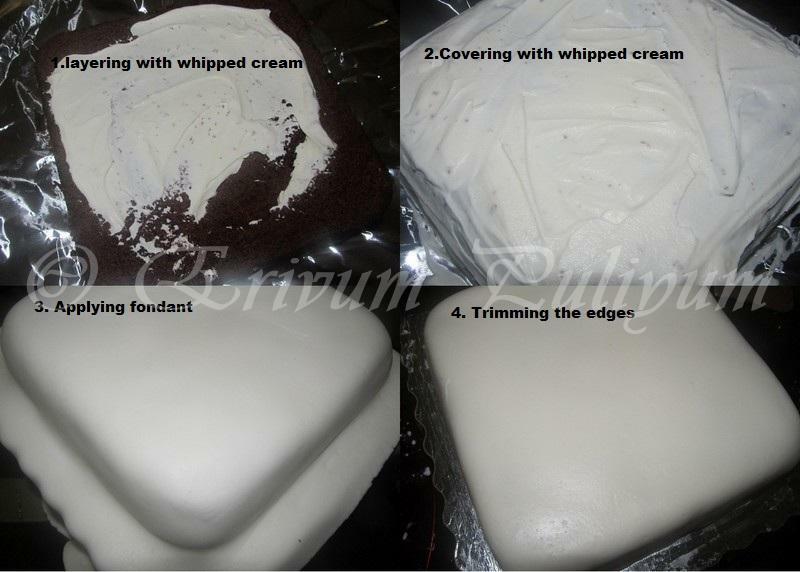 I also use the same kind of recipe for fondant :) Waiting to see more of your creative fondant designs! Delicious and great work Julie. Roses came out so good and cute. Wow! Your first attempt is so amazing. I am impressed! You done awesome job Julie, beautiful cake. Your better half will be very happy. Wonderfully made it Julie, I can guess how much busy you are today dear. Seeing your excellently decorated cake, I am just spell bound. Happy Birthday to your husband. B'day wishes to him!! Wonderful cake for spl occasion.. Just perfect!! The cake looks so gorgeous!! beatiful! I am sure your husband would like it a lot! well done. You did it n it looks good. happy bday hub. Loved those pink roses, the cake looks so inviting with the white outside and the brown chocolate cake inside. Perfect!! happy birthday to your husband :) awesome cake..
this cake looks so pretty and i want to grab a piece.the fondant surely takes it a notch higher. Delicious and mouthwatering cake. Excellent preparation. Ohhh! WOW Julie.. that's fantastic.. can't believe its ur first attempt! This looks SO good! Beautiful cake, Julie.. Great job!! What a pretty cake - great job with the fondant! Beautiful ale Julie... Great work..loved ur roses. How long did it taken2 finish the cake ? 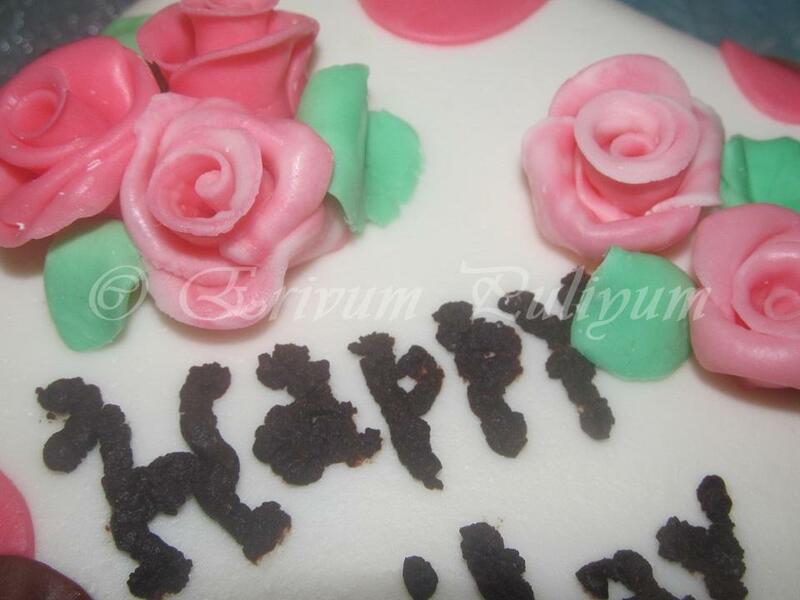 Look great for your frist attempt...fondant is nice and smooth and the roses are perfectly done! such a great job julie!superb pretty home made b'day cake for your hubby!! A perfect cake and amazing fondant decorations. Simply amazing. Great work dear,looks so perfect and love those roses,adipoli dear, B'day wishes to your hubby. Belated B'day wishes to your hus..Beautiful looking cake..
Julie, not only it look beautiful from the outside but the inside look moist and delicious too! Great fondant cake; good on you! Superb effort. Your husband must have been very proud of you. It looks very difficult to do. Oh dear, you have done an excellent job! Looks gorgeous! How to make Ginger-Garlic Paste at home ?? Palada Payasam - A Guest Post for Divya ! !